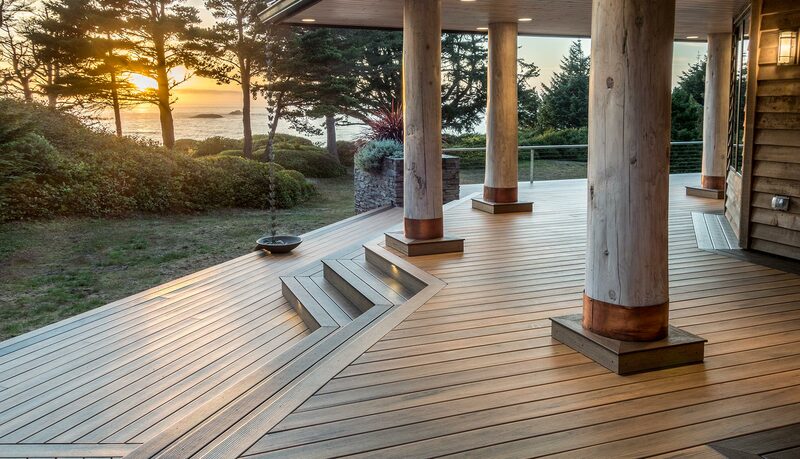 With proper installation and care, TimberTech products will provide years of outdoor living pleasure. 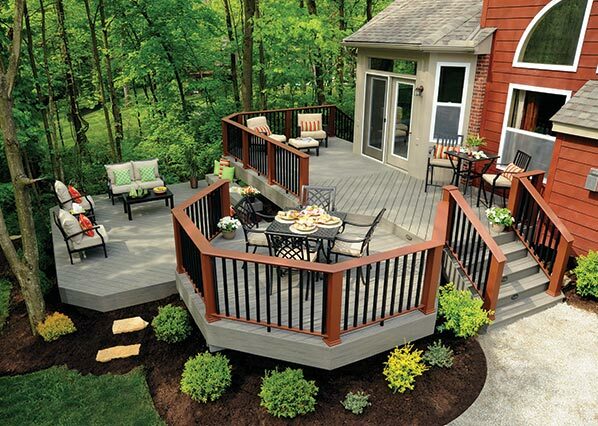 Congratulations on your new TimberTech® Deck. We know you want to keep it clean and looking its best, so here are a few guidelines on the best products and methods to use to keep your TimberTech Deck looking great. These recommended products can be purchased at many hardware stores including Lowe’s and Home Deport as well as online. Always make sure to read the cleaning product manufacturers specific information before using any product on your TimberTech Deck and follow their instructions. The correct brush is very important so that it not only cleans the surface, but also does not damage or dull the plank surface. We recommend using either the Quickie® Professional Pool and Deck Scrub or a medium plastic bristle deck brush. Do not use a natural fiber deck brush on capped composites as they can dull the surface. For general periodic maintenance cleaning, use a dilution of mild liquid soap and water. Dawn Ultra® has shown best results. For more difficult to remove dirt, mud, clay, or surface contamination, use an all purpose cleaner like Chomp® Pro Gutter Cleaner or Zep® Fast 505. *Note that composite deck cleaners such as Corte Clean®, Thompson’s® Water Seal®—Oxy Action, Olympic® Deck Cleaner, or other cleaners specified as composite deck cleaners, in powder or liquid form, should not be used with TimberTech Terrain, Tropical, or Legacy Collections. 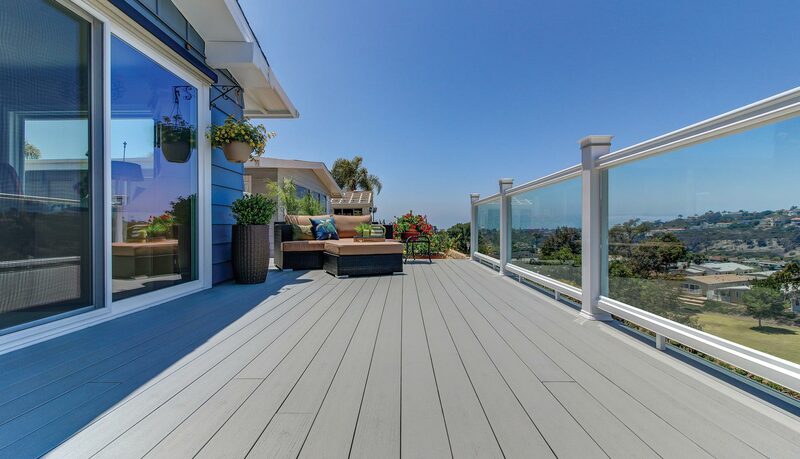 TimberTech Terrain, Tropical, and Legacy Collection deck planks are a capped composite material, the cap of these products are not comprised of a wood/plastic composite. Work in small manageable areas. Avoid cleaning in direct sunlight, the UV and heat will dry the surface quickly as you attempt to clean. Saturate the area with one of the recommended cleaners and allow the cleaner to soak for 30-60 seconds. Do not allow the cleanser to dry or evaporate before scrubbing. Rinse area thoroughly with water after scrubbing. Using the recommended brush and extension handle, scrub using moderate downward pressure, first scrubbing in the direction of the grain and then against the grain getting into the surface texture. Do not allow the treated area to dry before rinsing thoroughly as this will allow dirt residue to dry in the surface texture. Thoroughly rinse the treated area with clean water, then allow the area to completely air dry. Note that any residual cleaner residue can leave a difficult to remove surface film, always rinse thoroughly and never allow the cleaner to dry/evaporate on the surface prior to rinse. Although TimberTech® products are low-maintenance, we recommend periodic cleaning to help maintain the beauty of the product. TwinFinish, ReliaBoard and DockSider are composite products, and cleaning is not the same as for capped composite products. A power washer can be used when cleaning TimberTech products. The recommended maximum pressure is 1500 psi for TimberTech decks. A fan tip nozzle should be used along with the proper cleaning product. Spray in the direction of the brush/grain pattern to avoid damaging the product. Use caution not to damage the material and always take the proper safety precautions when operating a power washer. 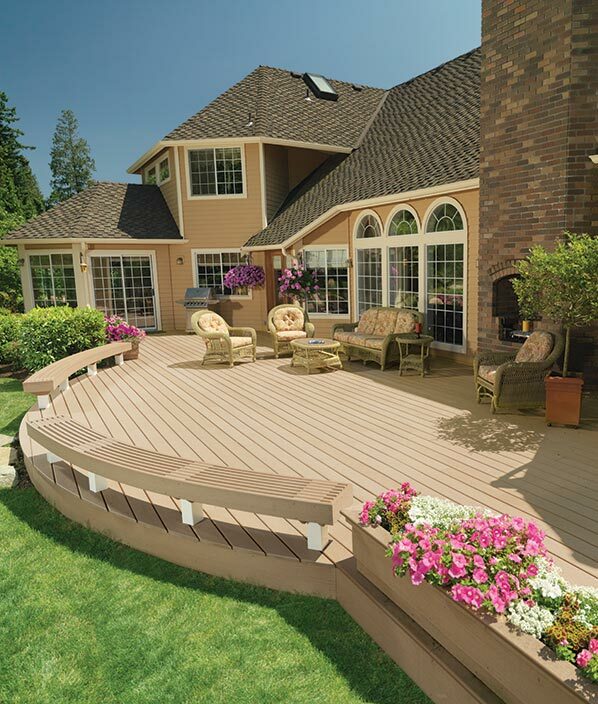 TimberTech® wood/plastic composite products are formulated to inhibit mildew growth and minimize staining. Rinse off your TimberTech products periodically with a hose. Even if it appears clean, it is important to prevent build-up of pollen/debris. Mildew stains may occur where moisture, pollens and/or dirt are present. Mildew needs a food source to grow, which can be grass, pollens, dirt, debris, wood and wood resins. Maintaining a clean dry surface is the best method for combating mildew. Ensure that water drains effectively from your deck. For TimberTech TwinFinish, DockSider, and ReliaBoard, be sure that gaps exist between planks to allow for drainage. Like any other wood-based product, TimberTech’s wood-plastic composite products (ReliaBoard, TwinFinish and DockSider) may experience a naturally occurring process called Extractive Bleeding/Tannins. This process may cause temporary discoloration that will weather away with exposure to flushing rainfall and UV. In most cases the weathering process takes 8-10 weeks but could vary depending on location and specific product application such as a covered porch. Tannins may also be cleaned by utilizing the cleaners referenced for Basic Cleaning Recommendations for ReliaBoard, TwinFinish, and DockSider. These guidelines may not cover every care and maintenance scenario encountered. For additional questions about care and maintenance, call (800) 307-7780. 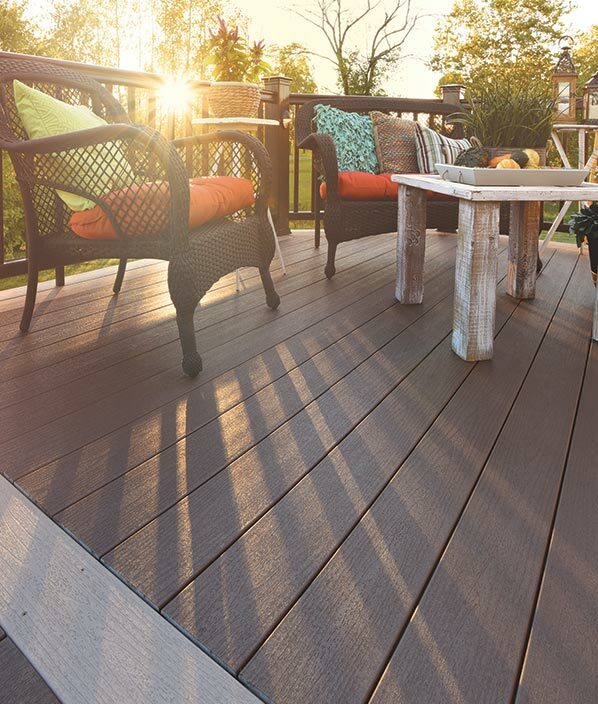 To keep your TimberTech deck looking its best, here are a few additional things to consider. Depending on environmental conditions, TimberTech product colors may appear to weather over time as part of the natural weathering process. Please be aware that excessive heat build on the surface of TimberTech products from external sources such as, but not limited to, fire or reflection of sunlight can potentially lead to damage. For example, sunlight which may be reflected by low-emissivity (Low-E) glass can potentially lead to damage of exterior building products, including TimberTech Deck, Rail, and accessories, due to elevation of surface temperatures which far exceed that of normal exposure of the same materials to direct sunlight. Possible damage by such reflected concentrated light may include melting, sagging, warping, distortion, surface discoloration, increased expansion or contraction, and unusual weathering. 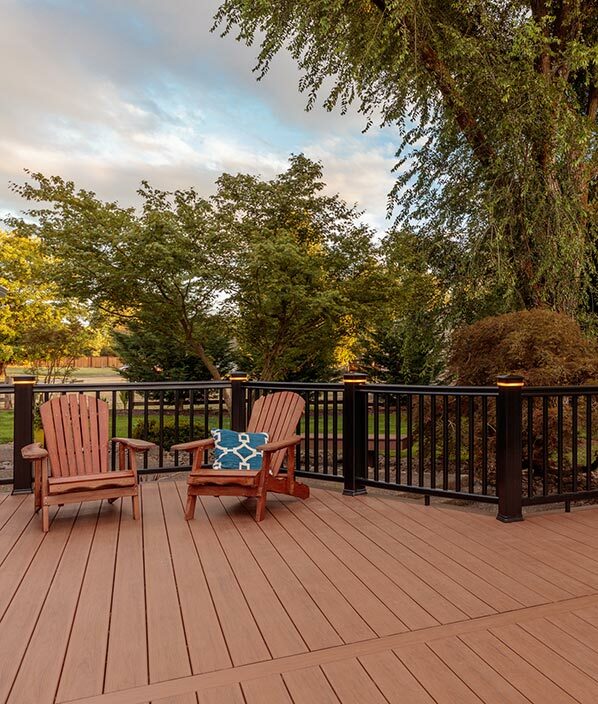 Although TimberTech Deck products are cooler to the touch than many other deck board products in similar colors, all decking products will get hot in the sun. 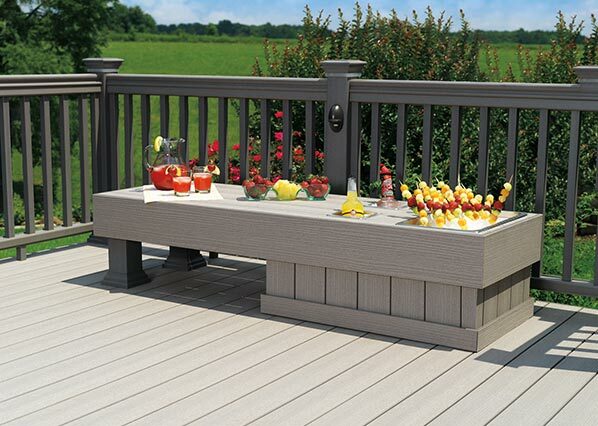 Additionally, the darker the decking color, the hotter it will feel. The buildup or generation of static electricity is a naturally occurring phenomenon in many plastic based products such as carpeting, upholstery, and clothing, and can occur on alternative decking under certain environmental conditions. 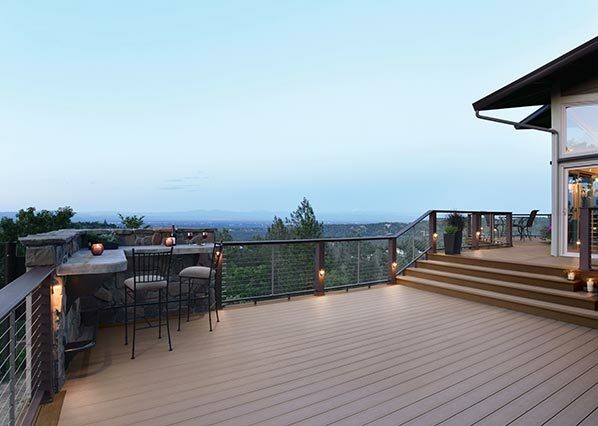 As with any walking surface, TimberTech decking products may become slippery in winter weather. Take caution when walking on your TimberTech deck in these conditions. Most products containing calcium chloride can be used without damage to the deck/porch surface. These products may leave a white residue which can be cleaned using the cleaning guidelines above. Metal shovels or plastic shovels with a metal leading edge may damage the surface of TimberTech decking and are not recommended for clearing snow from the deck surface. Do not allow airborne dust from concrete, landscape blocks, or any masonry product to accumulate on the surface of TimberTech Deck, Rail, and accessories as it may damage the surface of the deck. Do not cut any product on or near TimberTech Decking Products. Always remove job site dust, clay, dirt, mud, and other construction products from TimberTech Deck, Rail, and accessory products quickly. Do not allow construction dirt and debris to sit on the TimberTech Deck surface. 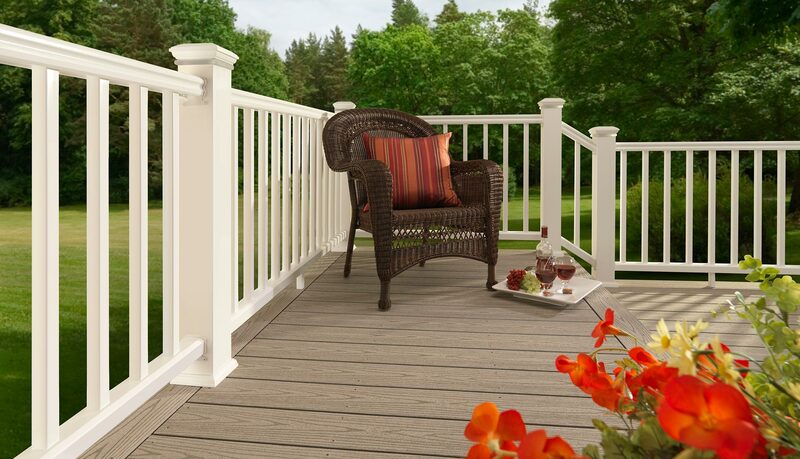 Do not cut metal objects such as railing on the deck surface, the hot debris from the cut may become embedded in the deck surface resulting in staining and damage.